Augusto Del Noce is widely considered one of Italy's foremost philosophers and political thinkers in the second half of the twentieth century. He is also remembered as an original and profound cultural critic, and in particular as a great scholar of the process of secularization that took place in the West during the 1960s. 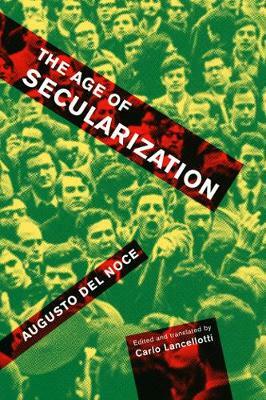 A collection of eleven essays and lectures by Del Noce that originally appeared between 1964 and 1969, and which the author published as a book in 1971, The Age of Secularization quickly became recognized as one of the most original and penetrating attempts to interpret the cultural and political turmoil of the period. In its pages Del Noce discusses, among other topics, the student protests of 1968, the counterculture of the 1960s, the significance of the sexual revolution, the nature of the technological society, and the relationship between Christianity and modern culture. The Age of Secularization documents the encounter between a key period of contemporary history and the full intellectual maturity of one of its most perceptive observers. It makes available to English-language readers a lasting reflection on the philosophical roots of contemporary culture, and it is just as illuminating and topical today as it was nearly fifty years ago.